The power of the Looker platform still surprises me. Just when I think I’ve seen it all, I’m reminded again of yet another of its capabilities. I am especially impressed with the seemingly endless creative ways users utilize Looker. I’m always learning about unique ways people share data through emails and Slack, or create simple A/B tests with statistical significance. That said, a data platform is not ideal for conducting your day-to-day business. A data platform is… well, it’s a platform - a basic foundation for building upon. A house needs a solid, dependable foundation, but without the house, you’re left with only a foundation. The first product we built on the platform was our one-of-a-kind BI tool. Over the years we’ve proudly watched customers build impressive, fully functional applications using Looker’s BI tool. To date, our focus has been on creating the ideal data platform and BI product, leaving the building of additional products to others. But this all changes now. 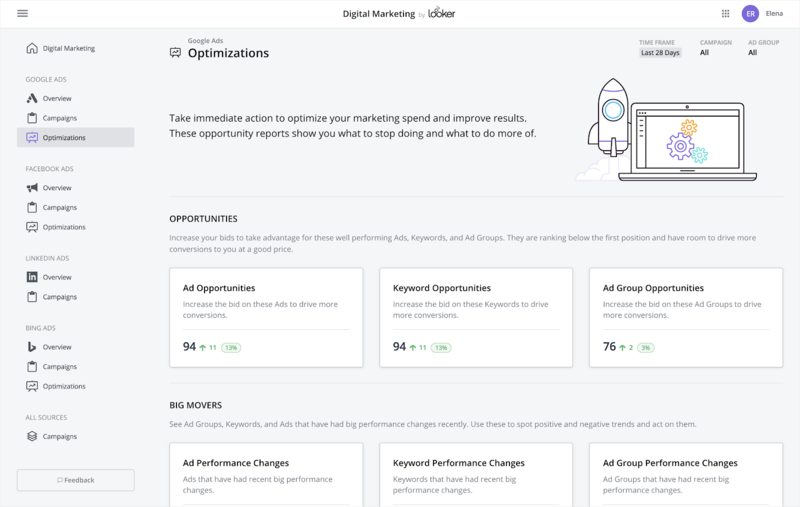 As part of Looker 6 we announced two applications in beta: one for digital marketing and one for web analytics. Applications are easy to use, enhanced Looker experiences for specific workflows. In addition, they’re plug-and-play, which means that we - the people who specialize in something other than data - are able to get Looker up and running quickly, without the help of IT. For example, a digital marketer can keep a close eye on their ad spend from an application. In a matter of a few hours, they can get this up and running themselves and are able to have fresh, cross channel analysis at their fingertips at all times. And if that weren’t enough, they’re gorgeous. 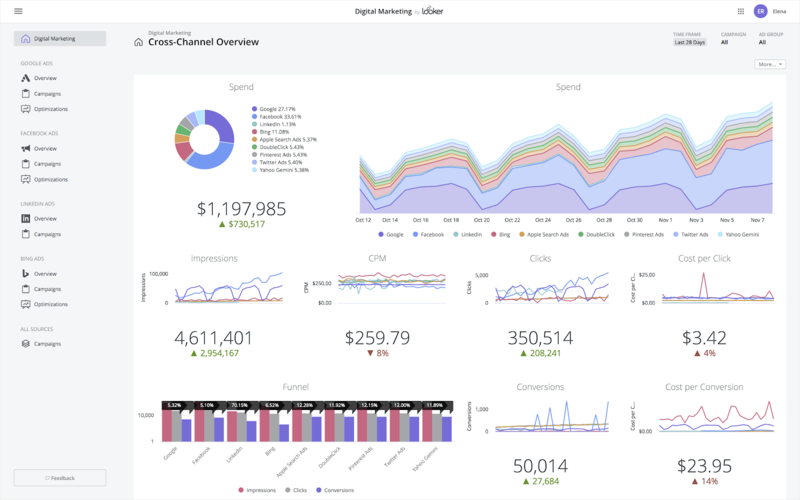 Running the digital marketing application within Looker gives you one place to view and analyze paid marketing spend across channels like Google, Facebook and more. Making life even easier, the application even suggests optimizations that can be made to maximize every dollar spent. We’re especially excited about these applications because of what they are setting the stage for. To revisit my house analogy: these are spec houses in an emerging neighborhood. They’re built on a strong foundation and for a certain audience (digital marketers in this case) but with a general design to allow people to personalize as needed. And these are just our first applications — paving the way for developers to build more applications for more people on the Looker platform. There is more to Looker 6 than the personal and practical experiences delivered by applications. The product is now more powerful and easier to own. Enhancements to the underlying platform will help customers stay agile as technology and business needs change and expand. And to make Looker easy to own, we added on to our world-class support offerings, created more flexible services packages and announced upcoming availability in more languages. Learn more about Looker 6 and Applications with our introductory webinar, or request a demo of the Web Analytics or Digital Marketing Application.